Do you remember the unfortunate tale of my fiddle leaf fig tree? Well, I must like to live life on the edge. We have a new fiddle leaf fig in the family! This happy guy is from Ikea. Fiddle leaf figs have a reputation for being pretty fussy plants, but so far so good! He’s been hanging out in one slightly sheltered corner of our front porch for the past few months, absolutely thriving in the bright light! I suppose now that I’ve moved him he will be upset. The entry gets good light from the windows and skylight, but I’m pretty sure fiddle leafs don’t like to be moved so this could prove to be a deadly mistake. In addition to not being moved, they apparently like bright but indirect sunlight. I’ve also heard that it’s important to wipe off their leaves when they get dusty. But then again, my last one didn’t survive so I can’t quite call myself a fiddle leaf expert…yet. Heheheh. 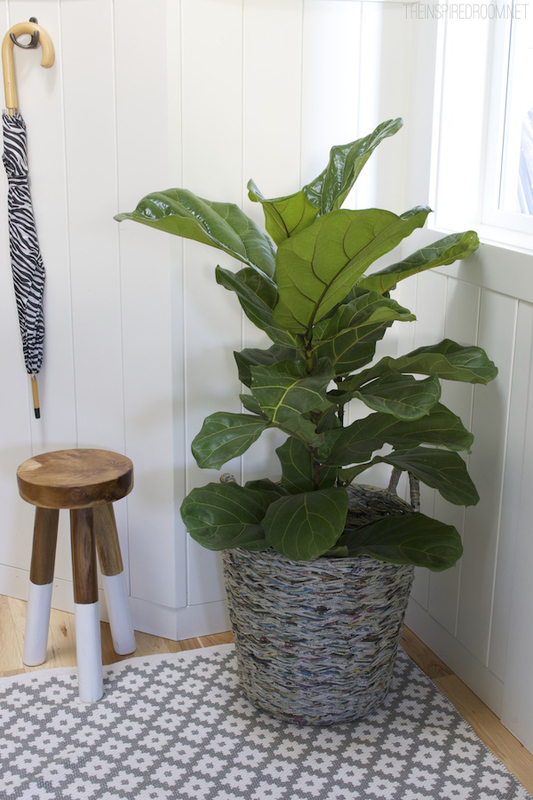 Do you have a fiddle leaf fig? What are some of your favorite indoor plants? *We were provided this indoor/outdoor rug by RugStudio. It’s the Samode Rug by Dash & Albert, we love it! I’ll show you more of it soon! I got my fiddle leaf fig from Ikea about a year ago, and so far it is still going strong. I move the thing around all the time, but it is always near a large window. I water it when the leaves are looking droopy by sitting it in the bathtub and giving it a good drink! I sometimes forget to dust the leaves and it still is thriving! My Tree was near death and I just tossed it out on the back deck as a last ditch effort and it’s actually doing so much better! I think it just needed some humidity! I have a fiddle leaf fig that I have had for 36 years, it has moved wherever I have moved over those years. It has grown from a small plant to a very large leggy plant to one that I have cut down and it is resprouting new leaves. I just water when dry and try to provide right amount of light. I wish I had a conservatory sun porch in which to place it, but alas only a regular home. I do love it though, my parents gave it as a gift for my birthday my first year away from home. i love these plants, but i have had terrible luck at home depot with them. i honestly think they were diseased because they had black spots on the leaves. i kept the soil moist, not wet, indirect light and the leaves would just drop. took both of them back. fiddle leaf figs are prone to black spot fungus. if they are spotted at the store, do not buy them, they are already diseased. there are fungicides available to treat but honestly it’s just easier to start over with healthy plants. ikea has brought in really healthy plants in good quantities this year. Just picked a fiddle leaf plant up last week and it’s thriving so far! Except today it’s storming outside and pretty dark out, so I’m afraid it won’t get it’s bright light for the day! Got mine at IKEA too a year ago. Just posted about how I take care of it. I would love one, but I know my dogs would not leave it alone! I have two fiddle leaf figs, got them from Amazon a couple of years ago for $7/each. I planted them in Ikea baskets and they did great on my back porch, morning sun and afternoon shade. Then I moved them to corners in my dining room which gets filtered light throughout the day. In the past year one has only added one leaf and the other one didn’t grow at all. I got tired of them not growing, so yesterday I moved them back out to the back porch where I’m hoping they will start thriving again. They are such beautiful trees! Not going into fiddle leaf fig land … I stick with indoor plants I can’t kill, i.e. the corn leaf palm. I had that one for over 30 yeats but it got so happy it actually bloomed and about a year later, it’s life cycle was done. Have you tried Mother in Law’s Tongue. They make an nice contrast with leafy plants and are super hardy. They are suppose to be poisonous to animals, but my cats have shown no interest in it. I love houseplants! I have two Areca palms, a St. George’s Sword, two types of pothos and many, many specimens of succulents and cacti. I love to out together terrariums, also, and have recently installed LED lights to brighten up the light to three of them. We will see how it turns out since it was a little too dark in my bookshelves for them. Now I have ambient light in my den, lol. I have a funny fiddle leaf fig story. I purchased two for the front of my garage. It took months for me to find two large pots that I loved and could afford, ceramic pots 3.5 ft tall are pricy. They thrived, looked amazing and grew well. Well after about 1.5 years we had a huge wind storm and they blew over, one pot survived the other smashed. We didn’t have anyplace to put it so we just threw it in the ground in the backyard, did I mention we live in Florida? It is in the BLAZING sun! It is now about 6-7 ft tall and around! I just can’t believe it! Maybe 2nd time will be the charm! I’ve never owned one, but it is important to wipe the dust off the leaves. Less chance of bugs. I’ve had my Fiddle Leaf Fig for 12 years. I repotted it recently and moved it to a new window and it is very happy! I got a fiddle leaf fig a few months ago from Ikea and was really worried about it . . . I have a black thumb and I live in Utah, so it’s extremely dry here. So far though he’s doing great! I water about once a week and dust off the leaves with a damp paper towel. Hopefully he keeps going strong. I do … My FLF is about 6 ft tall and has moved from family room to master bedroom, and now loving our entryway. It has a big skylight overhead that gives great light but no direct rays, and hasn’t lost one leaf since this move. I water once a week and made sure it was transplanted in excellent soil.